Sara Bareilles is so good I feel a little guilty for not listening to her more. The truth is I hear her songs quite a bit, especially tracks from her 2007 debut Little Voice, because my daughter plays the hell out of them on long drives. 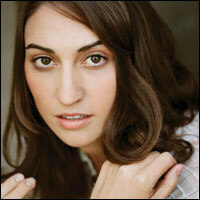 But Bareilles’ second album, 2010’s Kaleidoscope Heart, is very good as well and I never play that one. And I’m ashamed to say I didn’t even know she had a third album, 2013’s The Blessed Unrest, which was nominated for an Album of the Year Grammy (it lost to Daft Punk’s Random Access Memories). She has an endearing personality, as she demonstrated in her adorable stint as a judge on The Sing-Off. She makes endearing videos, such as the one for today’s SOTD, in which she hides herself until the last few frames and instead depicts gleeful lip-synching by Ben Folds, Adam Levine, Sugarland’s Jennifer Nettles and others. Today we have another installment of “stuff my daughters like to listen to in the car.” I could really do a whole theme week on that topic, and maybe I will one of these days. The good news is I’d wind up with a week of songs I really like as well. They started off with Neko Case and M.I.A. 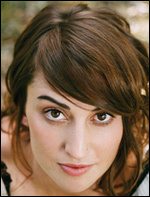 and now are partial to Sara Bareilles and Rihanna (and I don’t think they appreciate Rihanna for her looks, so there!). Just recently they’ve reintroduced Laurie Berkner to the rotation, and as kids’ music goes, she’s as good as it gets. This cartoon came to mind recently when I picked up Little Voice, the debut CD by Sara Bareilles. Only in this version it would be Joni Mitchell teaching the class, Tori Amos in the first seat, Fiona Apple behind her and Sara Bareilles in the back row. Throw in Nellie McKay and Rachael Yamagata while you’re at it.